An Easy Chicken Enchiladas Recipe has never been so easy or nutritious. Using bone broth instead of a creamed canned soup makes this a must-have recipe! Chicken Enchiladas have always been a treat for us – we only enjoyed them at a restaurant. And, with our family size, that was not very often! But, not anymore! This Easy Chicken Enchilada recipe is soooo simple, I wonder why I never made them before! Plus, it uses chicken broth instead of a canned creamed soup for added nutrition! Because who says main dishes from Mexican cuisine have to be carb-heavy? 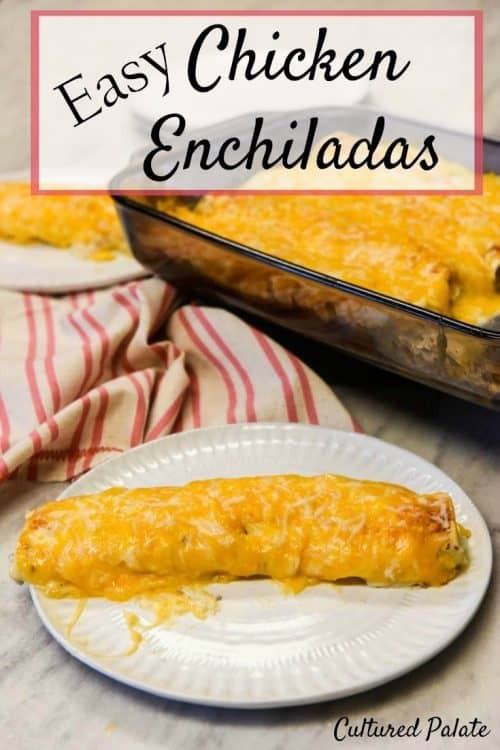 This Easy Chicken Enchiladas recipe fits the bill if you are looking for a recipe to make ahead and reheat! That is totally me during pruning season in the vineyard! I personally like it reheated—the cheese bubbles nicely and you have a gooey, protein-dense delight. I guess the flavors have had a chance to meld and well, they is just delicious! 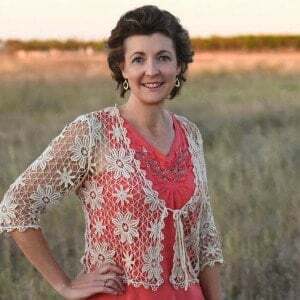 But, even if I am not working in the vineyard or garden, sometimes, it is just nice to have a meal that I can quickly pop into the oven or microwave to reheat. Reserve about a cup for the topping. I normally cook a whole chicken covered with water in the crockpot for 4 hours on high, allow it to cool and separate the meat from the bones. Use the water the chicken cooked in for broth. If you have time, use the bones to make the Chicken broth more nutritious – click the link for a video to show just how easy it is to make. And of course, there’s no problem if you can’t put the chicken in a crockpot. Just use cooked and shredded chicken. If you are on a gluten-free diet, you can still enjoy the great taste of Easy Chicken Enchiladas – just substitute corn tortillas for the flour tortillas and white rice flour for the flour. 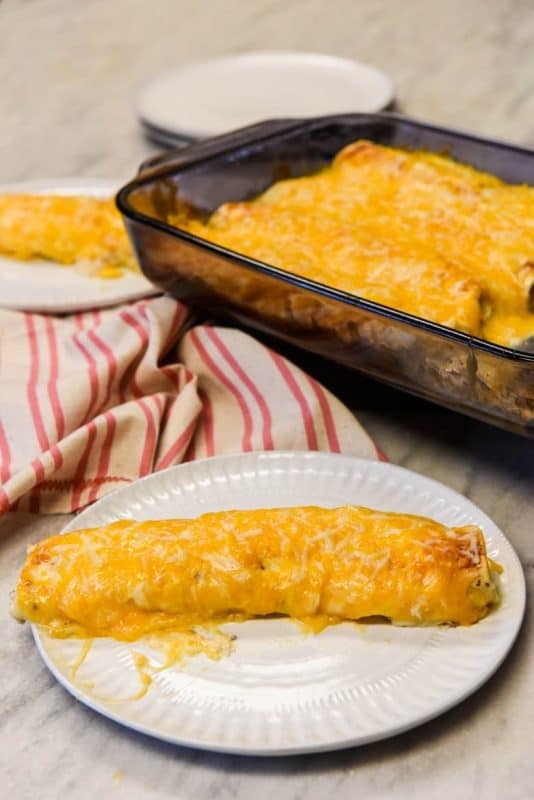 If you’ve tried this easy chicken enchiladas recipe or any other recipe on Cultured Palate please take a minute to rate the recipe and leave a comment letting me know how you liked it. I love hearing from you! You can also FOLLOW ME on PINTEREST, FACEBOOK, INSTAGRAM, YouTube and TWITTER. I love all Mexican food, so I hope you enjoy this take on enchiladas as well. 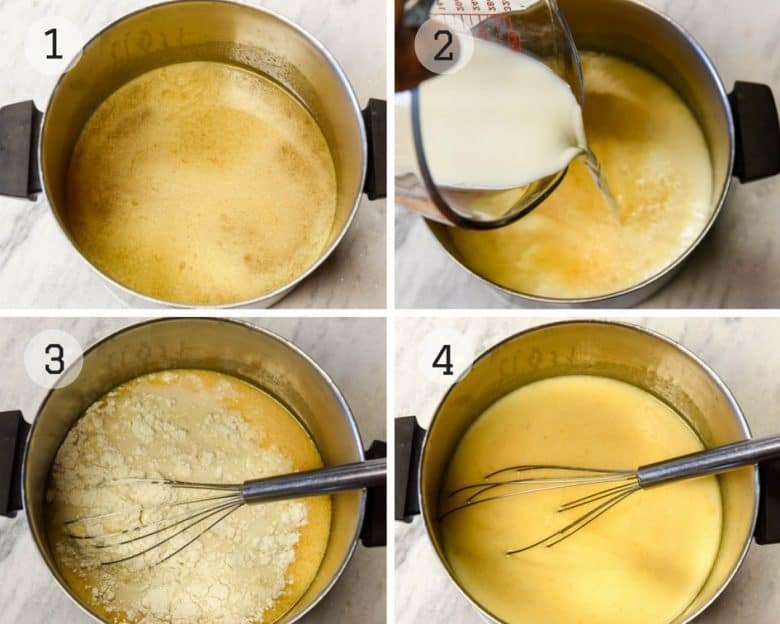 In a small saucepan, mix chicken broth and milk or coconut milk over medium heat. Once heated thoroughly, whisk in the flour and allow to thicken. Add salt and pepper to taste. In a large mixing bowl combine the broth mixture, chicken, sour cream (or yogurt), 1 1/2 c. each Monterrey Jack and Colby cheeses, green chilies and onion. Place 1/2 cup of the mixture on each tortilla; roll up and place seam side down in a 3 quart oblong baking dish. Spread the reserved broth mixture over the top thinly. Bake at 350 F for 20 - 25 min. Remove from heat and sprinkle with 1 cup Colby cheese and continue baking 5 minutes until the cheese is melted. I use a whole chicken that I have cooked in the crock pot. One whole chicken yields about 4 c. cooked meat. This recipe was designed to be a delicious way to reap the benefits of broth, plus natural protein sources. I normally cook a whole chicken covered with water in the crockpot for 4 hours on high, allow it to cool and separate the meat from the bones. Use the water the chicken cooked in for broth. Don't forget to use the bones for bone broth! Chicken broth is so delicious and is definitely one of the easiest broths to make regularly (if nothing else because the bones are much easier to source for most people). And of course, there's no problem if you can't put the chicken in a crockpot. Just make sure it's properly shredded. If you are on a gluten-free diet, you can still enjoy the great taste of Easy Chicken Enchiladas - just substitute corn tortillas for the flour tortillas and white rice flour for the flour. That will give it a nice salty crunch flavor that you may like even better. I know there are some true fans of corn tortillas out there! I hope you enjoy these enchiladas! What are your favorite enchilada toppings? Looks and sounds delicious! Will have to try! Elise, let me know how you like them! Thanks, Linda, they really are! 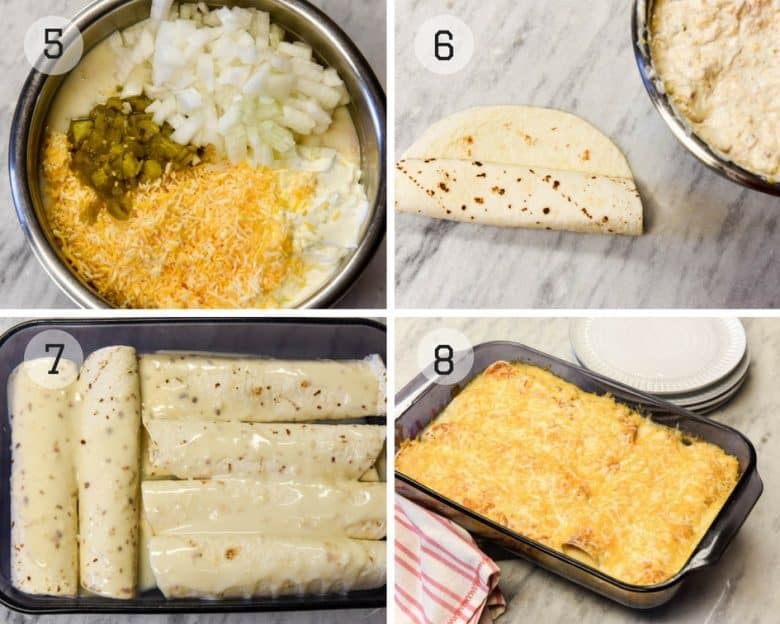 Craving enchiladas right now – these images are just incredible! Can i use uncooked flour tortillas for this recipe? I am not sure what uncooked flour tortillas are – I buy mine packaged ready to use. We enjoy eating chimichangas (sp?) when we go to Mexican restaurants. I’ve made this recipe twice now, once with purchased tortillas and once with homemade tortillas. This recipe is absolutely delicious. We think it tastes just like the restaurant’s chimis. Carolyn, thanks so much for taking the time to let me know – it is always encouraging when others like my recipes! These were delicious! I roasted an Anaheim chile instead of using canned. And I passed the recipe on to my mom, who also loved them. Oh yum, I’m drooling at these photos. This looks absolutely delicious!